Tattoo aftercare is the most vital part of getting inked. You may have a great looking tattoo, made by the finest tattoo artist, but if you don’t take good care of your fresh tattoo, the end result might end up as a big lump of scar tissue. 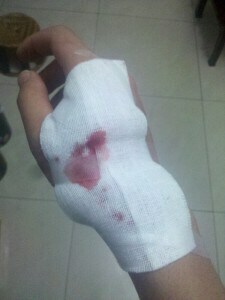 What type of bandage should I use plastic wrap or cotton gauze? Cotton gauze is better than plastic wrap because cotton gauze allows the fresh tattoo to breathe. Also, a cotton gauze absorbs blood and excess ink. And since a cotton gauze is applied is layers, it serves as a protective barrier against airborne microbes. Are there products available for tattoo aftercare? You’d be amazed by some tattoo parlors recommending nappy ointments or lotions for tattoo aftercare. Well who can blame them, in the past; there were no products available for tattoo care. Nowadays, there are a lot of products specifically for tattoo care, some are made of natural ingredients like grape seed oil and other vegan stuff, really good for wound healing. My tattoo is oozing amber coloured liquidly stuff, is this normal? Yes it is normal. That amber coloured liquid is plasma, which is typical in wound healing. When this dries up it will form a thick scab which is good for a healing wound, but we don’t want that on a healing tattoo. Wash any oozing plasma and don’t let it dry up. Can I wash my new tattoo? Yes, you can wash your fresh tattoo with a bar or liquid antibacterial soap, then pat dry with a soft cotton or lint free paper towels. Initially, you need to wash your fresh tattoo 4 to 5 times a day. Remember, we don’t want any plasma drying up. Then gradually reduce washing times. Can I use an antiseptic? No. Antiseptics dry up the tattoo wound and can even affect the colour of the tattoo. How long will a tattoo heal? Wound healing is different from person to person. Some people heal really fast, while others have sluggish healing time. Generally, it takes about a month for a tattoo to completely heal.